We recently posted an article on the “Best Female Freeediving Wetsuit” which generated a lot of interest. Fortunately, there are a lot of wetsuits available for men in Australia, especially if one goes for a spearfishing wetsuit. However, it is a lot more challenging to find a good male pool freediving wetsuit. So what would be the qualities of the best male pool freediving wetsuit? Firstly, the wetsuit must have low buoyancy to more easily achieve neutral buoyancy in the pool and to reduce the need of extra weight around the neck or on a dive belt. This means the wetsuit must be thinner in neoprene and not too bulky. There is also a trend in competitive freediving to do away with a dive weight belt all together in favour of a freediving neck weight. This necessitates a low buoyancy pool freediving wetsuit. Secondly, the heat insulation qualities of the wetsuit are not as important are those in the ocean as pools are warmer or heated in colder climates (as many public pools in Australia). Go for as thin neoprene wetsuit as possible. 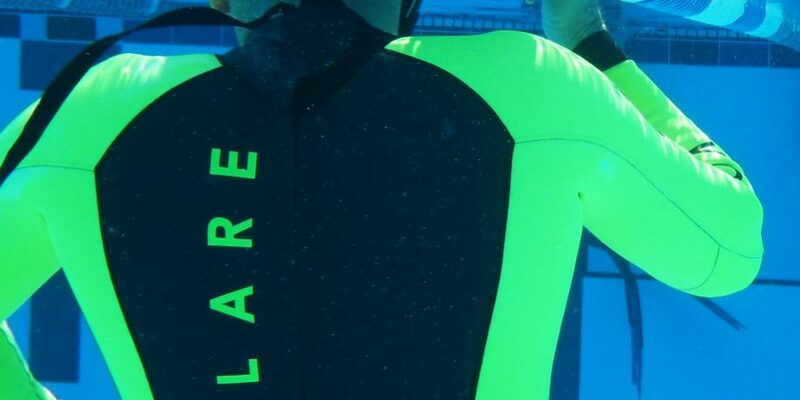 Thirdly, the wetsuits must be close fitting around the neck especially when the hands are held in the hydrodynamic position above the head as when using a monofin. Make sure the neoprene around the neck does not gather catching water and increasing drag through the water. Fourthly, the outside of the wetsuit must be of smooth neoprene to reduce drag through the water and to increase maximum distance per kick. Fifth, ideally the wetsuit is not too expensive which in my opinion is under $400. After all, it is possible to get an ocean freediving wetsuit under $400 or get a custom made pool freediving wetsuit if you want to spend more than $400. Traditionally, triathlon wetsuits are often recommended as they satisfy many of these qualities and are often offer a greater choice because of the greater popularity of this sport. This triathlon suit is interesting because with no sleaves it should be less buoyant than the full sleave V1 below. This should mean less weight is needed in the neck weight, if one is used. Again, it only has a 3mm neoprene body. The Volare website indicates that it has a “low cut neckline that is both comfortable and watertight”. I have not tried this wetsuit but it should be watertight when the arms are held over the head. (https://www.volaresports.com/collections/wetsuits/products/mens-triathlon-wetsuit). The V1 consists of 3mm Yamamoto neoprene in the body and 2mm neoprene in the arms and legs and is “designed specifically for swimming and triathlon”. Nevertheless, it is a good option for an introductory pool freediving wetsuit. I have used this wetsuit for over a year and it is standing up well to about twice a week in the pool. Like the V1 Sleaveless it has a low cut neckline. The Orca TRN triathlon wetsuit has been a popular pool freediving wetsuit for many freedivers. It has 4mm smooth neoprene over the hips and bottom which helps to “optimise the body position in the water”. Whether this is an advantage for freedivers or not is another matter. There is 2mm Yamamoto 39 neoprene over the shoulder and underarms for greater flexibility and this be should an advantage for freedivers in the pool. I have personally used two of these wetsuits. My first one was very durable but my second one barely lasted 6 months with tears first appearing in the neck area. I wonder if the quality has decreased over the years to keep the price down. The Mares Apnea Instinct is a two piece 17mm wetsuit with high waisted pants “dedicated to freediving competitions in warm water conditions”. As such it can be used for both the pool and ocean in warmer climates. I see no reason why the Mares Apnea Instinct wetsuit could not be very effective in the pool with its smooth exterior. A separate hood comes with the wetsuit. According to the Beuchat website (https://www.beuchat-diving.com/gb/wetsuits-freediving/293-zento-3278555193004.html) it is “excellent for freediving and outdoor swimming” with “smooth exterior to reduce the braking coefficient of the water and ensure supremely smooth diving”. It is not clear from their website on the quality of the neoprene in the Beuchat Zento wetsuit except it is called “elaskin” neoprene with “jersey inside”. I assume the latter is a form of nylon obviating the need to use detergent to slip the wetsuit on – which is definitely a positive for a pool. Most importantly it is only 2mm thick throughout which makes it a good low buoyancy wetsuit. Other interesting positives are a “closing comfort collar” with the Velcro turned outwards to avoid damage to the suit (which no other wetsuits in this review have). It is also apparently a unisex website. Generally, the consensus in the freediving community is that it is not possible to have a wetsuit that fits both males and females effectively and is usually a sign of cost cutting by the manufacturer to produce one suit that fits all. I think women need to be a little wary with this suit and should attempt to try one on before buying. Sizes on the Beuchat Zento Freediving wetsuit range from xxs to xxl. The Salvimar Pure Swim Mens Suit is apparently very versatile as it is “made for spearfishing, freediving, swimming and triathlon”. The Salvimar Pure Swim has 2.5mm neoprene in the body. I have only been using it a short time but it is a nice design, colour and cut. This is a specific freediving 1mm neoprene wetsuit with a slippery polyurethane surface ideal for training and competitions in a swimming pool. This is the thinnest of all wetsuits in this review for the best male pool freedivng wetsuit. The Cressi Triton is a 1.5mm wetsuit making it ideal for the pool since it is “designed specifically for swimming and free diving”. It has a smooth exterior finish. I think these eight wetsuits are all good options for the best male pool freediving wetsuit though of course to determine the best male pool freediving wetsuit is a question that will never easily be answered. At the end of the day all these wetsuits have advantages and disadvantages for the pool. Of course, the prices and associated websites shown here are only a guide and will need to be researched at the time of purchase. Good luck in finding the best male pool freediving wetsuit for you. If you find a good pool freediving wetsuit not listed here, please email us the link and we will update this post.